Esther Reid was born in Anglesea, Westmorland, Jamaica, B.W.I. on Christmas Eve, 1918. She was one of 12 children born to Dennis Samuel Reid and Ellen Mary Cleghorn. 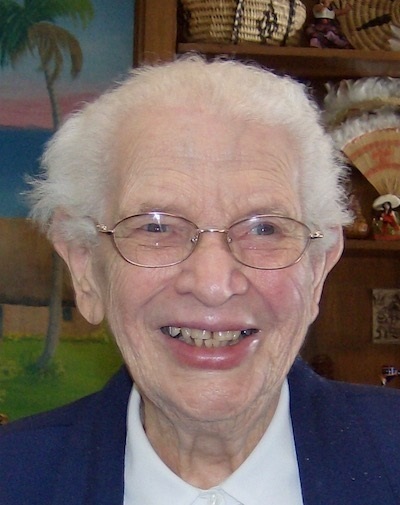 Esther Reid was born in Jamaica and grew up in a strong Episcopalian family of twelve children. Her family was well off until the depression in the 1920’s affected Jamaica and her father lost his job and the family lost everything. When her mother died in childbirth, her father was unable to care for the younger girls in the family and Esther and her three-year-old sister, Ethline, were sent to live in Kingston at the Wortley Home for girls run by the widow of an Episcopalian minister. While being separated from her family was extremely difficult, God provided a wonderful home in which she and Ethline received love, education and continued faith formation. At the age of thirteen, being old enough to look after herself, she returned to her family and, from that time onwards, Esther worked. After years of engaging in various jobs, Esther eventually got a job working for the US Army in Kingston. It was during this period that she felt the need for spiritual support and she found it in the Catholic Church. Guided by the Jesuit priest who served the Catholic community at the Post, Esther eventually became a Catholic. One evening she attended a movie at the camp and saw a group of Sisters who had been invited by one of the sergeants to see the film. When she saw them, Esther said that she was “immediately drawn to them like a magnet so I went and sat right behind them in the theatre to see what I could find out about them.” This was her first encounter with SMSM but, at that time, she didn’t speak to any of them. Soon after becoming a Catholic, she migrated to the United States and went to live in Arizona. Having been recommended by the Army for devoted service, she was able to register for US citizenship quickly. She got a good job through the recommendation of the wife of an Army officer and she regularly attended a Catholic Church near her apartment. The friendly atmosphere of that Church community helped to strengthen her faith. 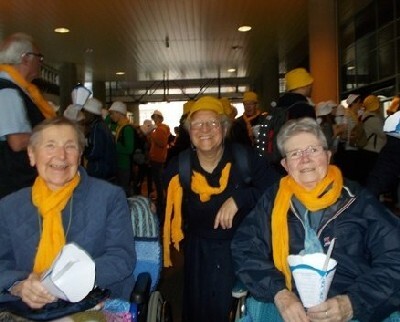 After a time, she saw a little Catholic magazine, The Sacred Heart Messenger, in the Church and noticed the ad “Wanted: generous souls.” Something struck a chord with her and she realized that the Sisters in the ad might be the ones she saw in Jamaica. After a time of trying to put it out of her mind, she finally wrote to get some general information. 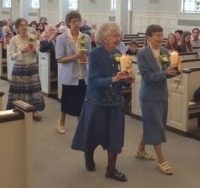 She was surprised by the warm and personal response that she received from the Sisters and entered into regular communication with them, discovering more about Mary and the spirit of the Congregation. During her vocational discernment, she kept in touch with her Jesuit spiritual director in Jamaica who encouraged her in this path. 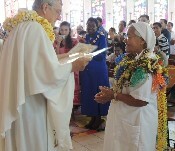 When she eventually requested to enter the Congregation, she was told that she needed to wait for at least two years after becoming a Catholic. So, she waited and became connected with another Congregation, doing odd jobs for them. After being Catholic for two years, Esther journeyed to Boston to become SMSM. Esther entered the Marist Missionary Sisters in Bedford, Massachusetts on July 31st, 1948. As a novice she took the religious name, Sr. Mary Aloysius. She made her first vows on February 1st 1951. She attended Fanny Farmer Cooking School and also obtained a certificate as Food Supervisor from the Holy Cross School of Culinary Art. From 1953 to 1956 she did cooking and sewing at the novitiate of the Marist Fathers in Staten Island, NY. 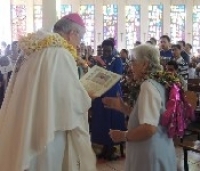 She was then missioned to Hawaii where she did the same services at St Stephen’s Seminary in Oahu. 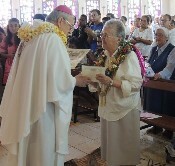 It was in Hawaii that she made her perpetual vows on February 2nd 1957. In 1964 Sister was missioned to the leprosy hospital, Hansen Home, in Jamaica, where she continued the work of cooking and sewing, worked in the office, and also taught the young girls at the Home. In the early 1970’s, when the Sisters moved out of Hansen Home and were invited to do pastoral ministry in the new diocese of Montego Bay, Esther happily served in Seaford Town, Porus and later Montego Bay. She took a Literacy Teacher Training course in 1971, and in 1973 a 4-month residential course in the Principles of Practical Social Work at the University of the West Indies. Always keen to grow in her understanding of the Faith and her ability to teach others, for five years she devoted her “spare time” to a correspondence course in Catechetics from the Diocese of Witchita, Kansas (1980-85). She also took opportunities to do short courses in Scripture and Theology both in Jamaica and in the USA. Esther was truly humble: she never put herself forward for praise or gain; she always looked for the good and the strengths in others and encouraged them to blossom. She lived the spirit of “abnegation” – forgetfulness of self – every day: while she had strong opinions and could make them known, she did not live out of the spirit of “self-referencing”, which seems to be the norm in the world today… Esther’s love for God overflowed to her love for the people to whom she was sent to serve – women, men, young and old, people in rural areas and those in the city, people who were materially poor and those who were spiritually poor. She was very aware of those around her and had a gift for reaching out to the downhearted and those on the margins, helping them in ways often hidden and unknown to others. 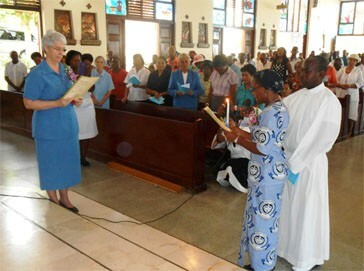 She was instrumental in starting several groups of Marist laity, both in Jamaica and in Belmont. She would take the time over a cup of tea to encourage our young sisters who might be having some difficulties with studies or work to keep trying and to stay close to Jesus and Mary. Sister Esther died on the morning of the Feast of Mary’s Birth, September 8th 2017, at the Elizabeth Seton Residence. We know that Mary and Jesus were waiting to welcome her with joy.